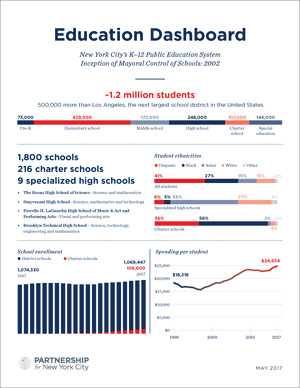 The introduction of mayoral control has helped to close the achievement gap between New York City students and their peers in other public schools across the state. 500,000 more than Los Angeles, the next largest school district in the United States. New York state adopted the more challenging Common Core standards in 2010, with additional revisions in 2013. Time limits for tests were removed in 2016. Title I is a program run by the U.S. Department of Education to fund schools with a high percentage of students from low-income families.